If you had a buy signal in Gold for Thursday, and buy signals for S&P, Dow Jones index, QQQQs and the Russell then you are having a great day today. If you had 699.80 as the likely turning point in Comex Gold, 815.85 as the likely low in S&P futures and 7967.50 as the turn in Dow Jones index as well as the date and price within 2 points variance for Thursday’s turn in QQQQ and Russell then you had an absolute bonanza. This week the Danielcode called all of these turns and the high in DX and US T Bonds to the day and within two points price variance from the Danielcode price levels. If you didn’t have advance warning of these important turns, I am going to show you just how simply Danielcode subscribers and many FSO readers were alerted to them. 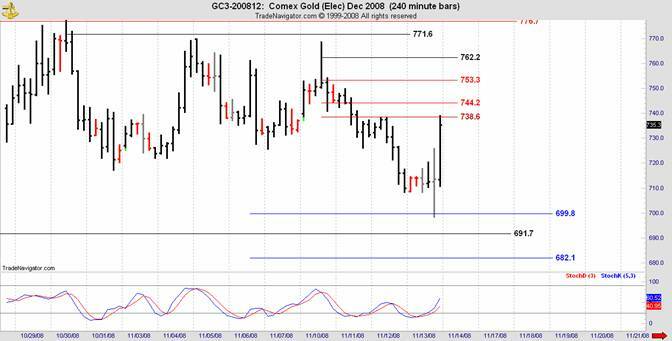 Here is the daily chart of Comex Gold covering the recent price action. 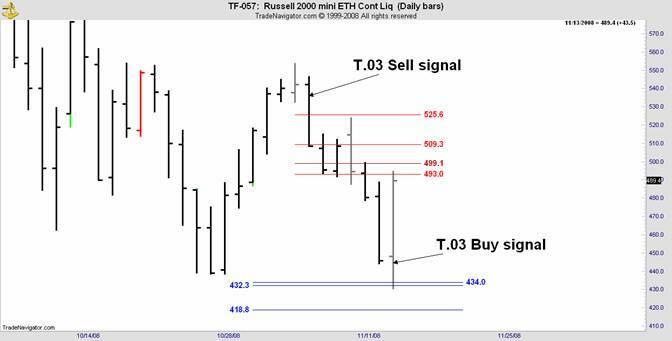 For 10/24 we had a posted T.03 buy signal in Gold. The signal is posted on its own web page and simply says “Yes-Buy”, “Yes-Sell” or “No” meaning no current signal. The signal is valid for two days and becomes valid at the previous day’s high/low but may be anticipated if shorter term signals support an earlier entry. 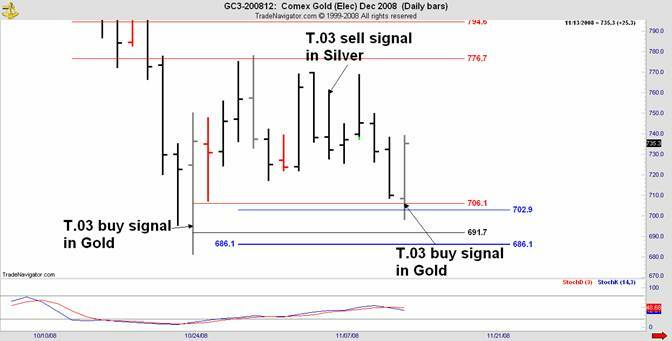 With Gold and Silver being highly correlated, a trade signal on one alerts us to watch for a mimic entry on the other. The chart shows the trade signals and the Daniel sequence numbers that support them. There. That was simple wasn’t it? There is a free T.03 tutorial video under the new “Videos” tab at the DC website for those who want to learn more. Once we have the daily signal posted in Gold or Silver we can drill down to the shorter term chart also on the DC website, in this case a 240 minute chart (we are lazy traders) and get a better focus on the likely turn numbers. Below is the members 240m chart for Comex Gold. At 699.8 we had a DC target line in blue. The fast stoch turned two bars before the low as you can see, but the market couldn’t make its turn other than at a DC number so it plunged to 698.2 to recognise the DC price target and then it was away, climbing $40 into the close. For clarity, Thursday’s buy signal in Gold was posted at 7PM US ET Wednesday so traders have ample time to prepare for the coming day. I provide these signals on 33 markets including Gold, Silver and HUI, all the major equity indices, commodities, forex, DX and T Bonds. We get plenty of action. 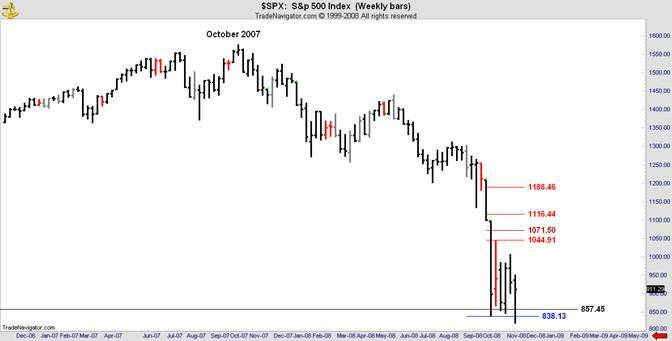 This is the S&P index weekly chart which has been published on Financial Sense for months. I have been telling my readers that the black line at 857.45 was the last level of Danielcode support and a weekly close below that level would be ominous. See how the black number has been tested on 5 of the past 6 weeks but so far the market has refused a close below it. The DC numbers are magnets! 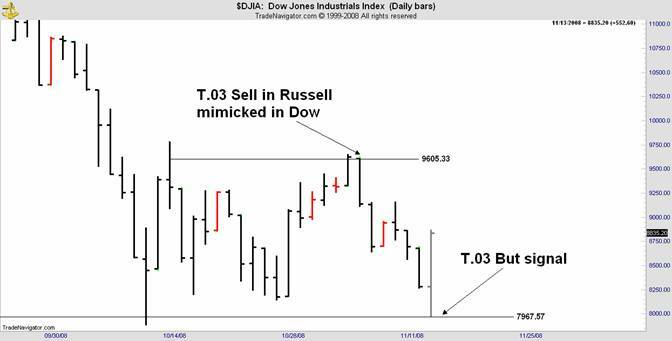 On the daily chart below, our recent trading centered around a T.03 sell signal issued for the Russell on Wednesday 11/05 and mimicked in the S&P and Dow as these indices are highly correlated. 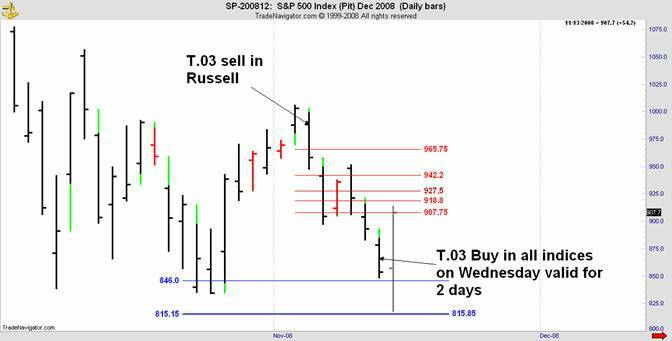 On Wednesday I posted a T.03 buy signal in S&P, Dow, QQQQ and Russell valid for two days, that is Wednesday and Thursday. Wednesday’s low was made near the prior DC number at 846 so that just left Thursday for the buy signal to bite. And bite it did making its low at 817.50 less than two points from the next DC target. Having met that requirement, S&P kindly gave us a glorious ride to its close at the first DC retracement number and over 90 points from the low, for some part of $22,500 per contract or $4500 per contract on the Emini. So we had time on the T.03 signal and price from the Danielcode targets and as Mr Gann so presciently said “When time and price are squared (equal) a turn will result. And what a turn it was. Is that the low, or as my children say on every car trip “Are we there yet?”. The answer is that for this leg-probably. An outside reversal bar made precisely at a major DC target is a powerful signal. If we have seen an intermediate low which the next few days will tell us, then it is only for a bear market rally. I am not in the camp that says trillions of losses can be swallowed in 13 months. Market woes will be with us for years but one man’s goose is another’s gander and for traders these are the best of times as historic volatility showers its rewards on traders who know. To match the S&P trade, Thursday’s buy signal in the Dow was elected with equal precision. This signal was even stronger. We had been riding the sell signal from 11/05 as it ticked off over 1600 points from its 11/04 high made just past the minor DC black line at 9605 and we knew on Wednesday that a reversal on the T.03 buy signal was a high probability. For this market (this is the index chart) we had the famous DC black line at 7967.57 and this number came off the monthly chart so was much stronger than a number from a daily chart. As predicted, the Dow made its low at 7966.2 just 1.3 points from its major DC support number on daily, weekly and monthly charts. The after lunch rally made 869 points from its Daniel number turn. Now you know how these signals work, here are the members charts for QQQQ and Russell as posted on Wednesday night. DC numbers not yet used on these charts have been removed. 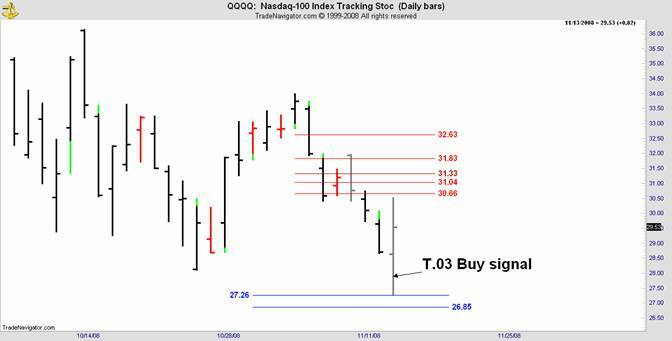 The low in QQQQ was 27.28 against the DC number at 27.26 which does not appear well on this chart. What part of these monster trades you got depends on your trading stance and commitment. 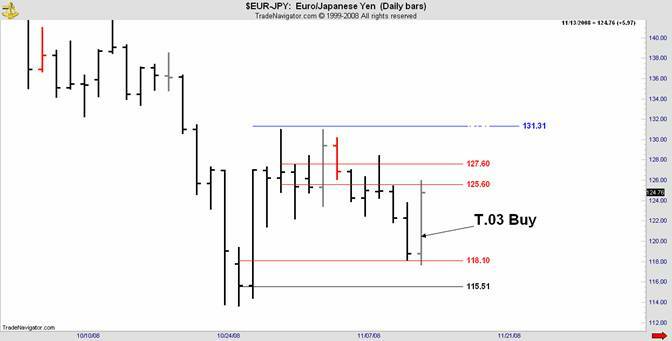 Full time traders saw the turn on the shorter term charts and got in early. Others were not so well rewarded. But there’s always plenty of choice at DC and for those who prefer other markets there was more. 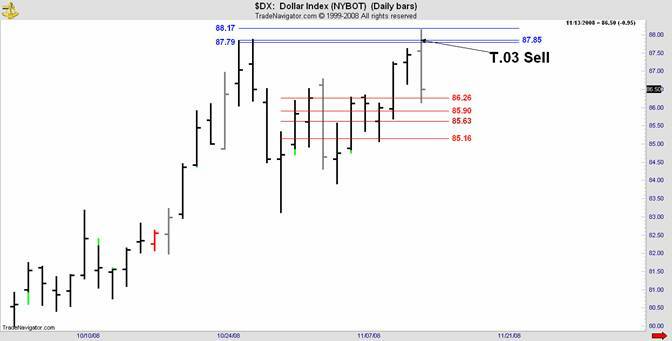 For Thursday I posted sell signals in T Bonds and the US Dollar index, DX. The methodology is the same. We had “time” turns on the T.03 indicator and price at a major Daniel sequence number to give us high probabilities of a market turn, largely unknown to others. 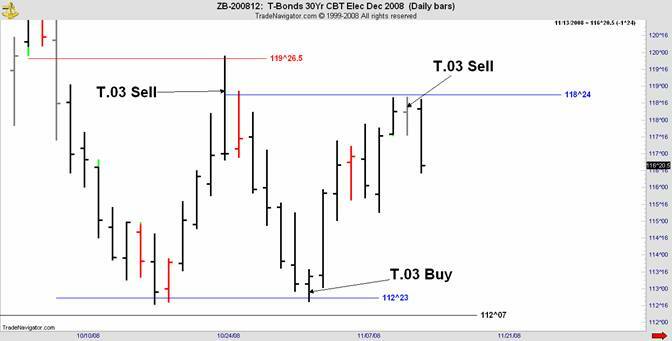 Here is the T Bonds chart. This market is rapidly attaining star status as DC traders had appropriate T.03 trade signals at the 10/24 high, the 11/03 low and Wednesday’s high. And that’s a lot of points in between. The Sell in DX posted for Thursday was of primary interest because of its continuing inverse relationship with Gold and the DX sell signal supported Thursday’s buy signal in Gold perfectly. This way we can be greedy and be short DX and long Gold to get a double barreled blast which is exactly what happened. On it’s own, DX was a nice trade and made its high at 88.15 just two ticks from the next DC number. For those who are interested in understanding which number will be effective, there are detailed explanations in trade manuals and trading videos at the website. At the DC website we have been recording all of the T.03 trades in forex since 07/01. Every trade in the model account is posted and verified by an independent third party. It has run at an 89.47% win rate in the past 128 days and returned 85.91% in that time. Click on the account history link at the Danielcode website and check out the trades and the assumptions the model makes. It sure helps to have a road map though before putting your money on the line. I have been short the builders, retailers, and financials and have avoided the violent up days just by paying attention to the Danielcode. Also, playing with Forex in a demo account, till I get it right. I have told people about this and they think I am crazy. There is no one I have been able to convince that you have an 85+ % accuracy rate with an +80% return in 4-5 or months. I am a statistician by trade, so I know what the probabilities are that you were 'just lucky'... I guess they would rather lose 50% or more in their 401K's, praying that the market will magically come back. I feel sorry for them, since I have a feeling they will pay yet even more dearly for denial. Whether your idea of terror is charging with the Light Brigade at Balaclava, riding with the Union Brigade as it smashed Napoleon’s 20th Corps at Waterloo and brought about its own doom, replaying the final act of Wellington’s epic battle as the British 18th Cavalry Regiment died in their scores to break the last square of Napoleon’s immortals, the vaunted Imperial Guards, or trading Equity indices with volatility in the 60s this week; or Gold or forex, you will be much luckier with a simple and logical solution from the Danielcode. Of nine T.03 signals called for and elected on Thursday including major turning points in the indices, all were profitable. Some hugely so. I trust that my rendition of this week’s adventures in trader land have shown you the simplicity and profitability that a proper application of time and the Daniel price sequences can return. And yes, we do this every day of the year. Denial will be the theme of next week’s article. Denial is the flavour of the month Down Under with today’s NZ Herald trumpeting a recovery in the property market which is down barely 9% from its bubble highs and the Australian newspaper proclaiming that a recent Mastercard consumer survey had 58% of Aussies saying that things have improved and they intend to increase their discretionary spending by 10% or more. The “China will save us” mantra is alive, well, and increasingly wrong as are almost all financial pundits these days. Staying close to markets and trading the bounty of historic volatility is infinitely more joyous than battling the slings and arrows of outrageous fortune, bailouts and TARPs. For those of you suffering shock and awe from the markets’ volatility, here is the true scary ride. What we do is just fun! "Forward, the Light Brigade!" was there a man dismay'd? Not tho' the soldier knew someone had blunder'd: Their's not to make reply, Their's not to reason why, Their's but to do and die: Into the valley of Death Rode the six hundred.